For established patients of record, you can edit patient information. Also, for new patients with appointments scheduled, he or she has a patient record with some basic information entered, but you can enter additional information to complete the record. On the Patient Information ribbon, click (or tap) the Edit Patient Information button . If the ribbon is not visible, click (or tap) the arrow button below the Patient Search box . On the Patient menu, under General, click (or tap) Patient Information. The patient's Patient Information page opens. On the Patient Information page, update a patient's information as needed. Name - Type the patient's first and last name and middle initial. Preferred Name - The name the patient prefers you use when addressing him or her. The preferred name can also be used on correspondence from your office. Title - Type a prefix for the patient's name, such as Dr., Mr., Ms., or Mrs.
Suffix - Type a suffix for the patient's name, such as Jr., Sr., or III, if applicable. 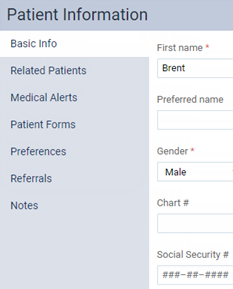 Gender - Select the patient's gender. Birthdate - Enter the date of the patient's birth. Status - Select Active, Non-Patient, Inactive, or Duplicate as the patient's status. Changing the patient's status to Duplicate or from Duplicate to another status requires the security right to manage duplicate patients. Chart # - Type a unique chart number (up to 10 characters in length; letters, numbers, periods, and dashes are allowed) for the patient. Alternatively, to have a chart number automatically generated for the patient, after you have entered the patient's first and last name, click (or tap) the Update button . First Visit - This is the date of the patient's first visit. This date is for reference only and cannot be edited. This date is updated automatically when you post a completed procedure for a new patient. Last Visit - This is the date of the patient's most recent past appointment. This date is for reference only and cannot be edited. This date is updated automatically when you post a completed procedure for a patient. Primary Provider - Select the preferred or primary provider for this patient. Discount Plan - Select a fee schedule to use for treatment-planned procedures and charges that are billed to this patient if the patient does not have insurance coverage. The difference between the provider's fee for a given procedure (or if there is no provider fee, the default fee) and the discount fee appears as a credit adjustment on the ledger. However, if the patient has insurance coverage, the selected discount fee schedule is ignored. Address - Enter the street address, city, state, and ZIP Code of the patient's residence. All correspondence will be sent to this address unless the patient is not the guarantor; in which case, bills, account statements, and other financial documents will be sent to the address listed for the patient's guarantor. By default, the address of the patient's primary contact, if that is someone other than the patient whose record you are adding, is entered. Tip: To copy the address of another household member to this patient's record, click (or tap) in the Address, City, State, or ZIP Code field, and then click (or tap) the Copy button of a household member. Only the address of the primary contact and other household members (if different) are available. Phone number - Select a phone type (Home, Mobile, Work, or Other), and type the correct Number and Ext (if applicable) for the patient. Sending automated text messages to mobile phone numbers is subject to the FCC's Telephone Consumer Protection Act (TCPA). That law and our terms and conditions require you to obtain consent from your patients before sending them any text messages through the Dentrix Ascend reminder system. Federal law dictates the form of prior express consent you must obtain. Prior written consent is optimal for all text messages, and may be required by law depending on the content of your text messages. The following is an example of consent language you may consider adapting for your practice. As a service to our patients, we provide courtesy appointment and recare reminder messages, and other important messages, such office closures, by using text messages. We also may send text messages notifying you of promotions our practice may offer from time to time. By providing your cell phone number, you consent to receiving text messages reminders and notifications at this number. You may opt out of receiving text messages by texting STOP to 45827 at any time. If you do not have a patient's prior consent, turn off reminders for the patient by selecting Home as the patient's phone number type instead of Mobile. To add another phone number for the patient, click (or tap) Add Phone. To copy the phone number of another household member to this patient's record, click (or tap) in one of the phone number boxes, and then click (or tap) the Copy button of a household member. Only the first (primary) phone number of the primary contact and other household members (if different) are available. To change the priority of the patient's phone numbers, click (or tap) the Move Up button of the phone number that you want to move up in the list. To remove a phone number from the patient's record, click (or tap) the Remove button of that phone number. These buttons are not available for the first (primary) phone number. If you enter a mobile phone number for the patient and then click (or tap) Save, below that phone number, the text Automated Text Reminders appears along with a status message (Yes or Carrier not Supported) to indicate that the number you entered has been verified as either a supported or unsupported mobile phone number. If the patient already has a mobile phone number entered, the status message next to the Automated Text Reminders text for that number can be, in addition to Yes or Carrier not Supported, No if the patient is the primary contact for himself or herself or for anyone else and has been opted out of receiving automated text message reminders (any other patients who have this patient as their primary contact have also been opted out). The patient's text message reminder status also appears in the upper-right corner and on the Contact Info tab of the Appointment Information panel that appears when you click (or tap) any of that patient's appointments on the schedule. 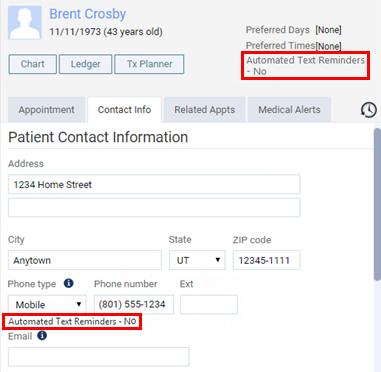 Once a supported mobile phone number is entered, and the patient's record is saved, the patient is automatically opted in to receiving automated text message reminders. Any other patients who have this patient as their primary contact or who have the same mobile number as this patient entered in their patient records are also automatically opted in. However, if the patient has someone else as his or her primary contact, the patient will receive text messages only if the patient's primary contact has a supported mobile phone number and that person is opted in. If you do not have patient consent, or a patient informs you that he or she no longer wants to receive text messages, turn off reminders for the patient by selecting Home as the patient's phone number type instead of Mobile. Patients who have consented may also opt-out by texting STOP to 45827 from their mobile phones. Any other patients who have this patient as their primary contact or who have the same mobile number as this patient entered in their patient records are also opted out. Email - Type the patient's email address. The email address must be unique across your entire organization (for all patients in all locations). Note: If the patient has someone else as his or her primary contact, the email address of the primary contact will be used for this patient, but you can type a different, unique email address for this patient if necessary. Primary Contact - To change the primary contact person for the patient, click (or tap) Edit . In the search box, begin typing the contact's name, continue typing as needed to narrow the results, and then select the appropriate name from the list of matching results. Or, to make the patient whose record you are viewing the primary contact, click (or tap) Switch to "Self" at the bottom of the results list. Note: If the primary contact is someone other than this patient (not "Self"), the name and Preferred Contact Method of the patient's primary contact appear on the Patient Information ribbon. Add New Member - To add patient records, at one time, for others members of the same household as the current patient, click (or tap) Add New Member. Note: A household is a group of patients who have the same primary contact person. The complete list of household members is available when you are viewing the patient record of any member of a given household. Secondary Contact - To add a secondary contact person for the patient, click (or tap) Add Secondary Contact. In the Select Patient field, begin typing the contact's name, continue typing as needed to narrow the results, and then select the appropriate name from the list of matching results. Primary Guarantor - To change the primary person who is financially responsible for the account, click Edit . In the search box, begin typing the guarantor's name, continue typing as needed to narrow the results, and then select the appropriate name from the list of matching results. Or, to make the patient whose record you are viewing the primary guarantor, click (or tap) Switch to "Self" at the bottom of the results list. Note: If the current patient is the guarantor, that patient and all patients for whom that patient is the guarantor appear in the list. If the current patient is not the guarantor, only the guarantor and the patient appear in the list. Secondary Guarantor - To add a secondary person who is financially responsible for the account, click (or tap) Add Secondary Guarantor. In the Select Patient field, begin typing the secondary guarantor's name, continue typing as needed to narrow the results, and then select the appropriate name from the list of matching results. Click (or tap) Add Medical Alert to attach medical alerts to the patient's record. Preferred Contact Method - Select whether the patient prefers to be contacted by phone, text message, or email message. For Call me, you must enter a phone number in the field that appears if a phone number is not already entered for the patient (if it is not already, this phone number will be made the first listed phone number for the patient). For Text me, you must enter a mobile phone number in the field that appears if a mobile phone number is not already entered for the patient (if it is not already, this mobile phone number will be made the first listed phone number for the patient). For Email me, you must enter an Email address in the field that appears if an email address is not already entered for the patient. These options are available only if the patient is his or her own primary contact. Currently, this information is for reference only. If someone else is this patient's primary contact, the preferred contact options are not available because the patient's preferred contact method is that of the primary contact, but you can click the name of the primary contact person shown to go to his or her patient record to view or change the preferred contact method for that patient. The selected preferred contact method appears on the Patient Information ribbon, which is available when you are viewing the patient's record. If someone else is this patient's primary contact, the name and preferred contact method of the patient's primary contact appear on the Patient Information ribbon. Similarly, if this patient is the primary contact for someone else, this patient's name and preferred contact method will appear on the other patient's Patient Information ribbon. The preferred contact method is not associated with and, therefore, does not determine whether the patient will receive automated reminders as text messages or as email messages. 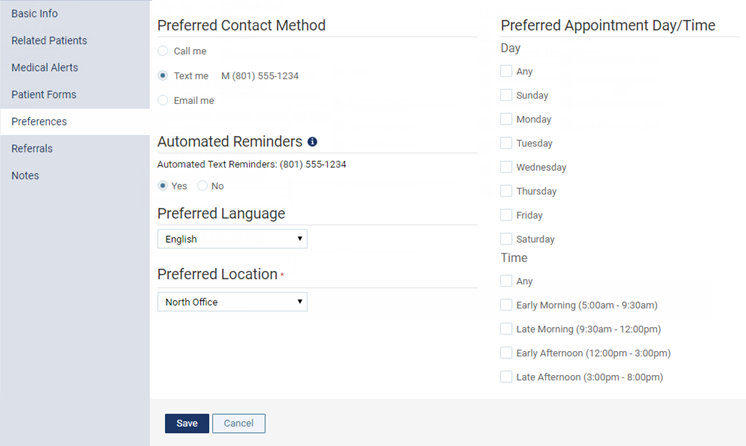 Automated Reminders - Select Yes or No to indicate that the patient (any other patients who have this patient as their primary contact) will or will not receive automated text message reminders for appointments and recare. These options are available only if a supported mobile phone number has been entered (on the Basic Info tab) for the patient and the patient is the primary contact for himself or herself or anyone else. Automated text message reminders for this patient (and any other patients who have this patient as their primary contact) will be sent to the mobile phone number displayed. If the patient has more than one mobile phone number, the first one listed (on the Basic Info tab) for the patient will be used for the automated text message reminders. If No is already selected, the date that the patient was last opted out appears for your reference next to the No option. Either someone in your office opted the patient out, or the patient texted STOP to 45827 from his or her mobile phone. Any other patients who have this patient as their primary contact or who have the same mobile number as this patient entered in their patient records have also been opted out. If Yes is already selected, and then you select No and click (or tap) Save, the patient is opted out, and the current date appears next to the No option as the opt-out date. Also, a text message, stating that the patient has been opted out, is sent to the patient's mobile phone. Any other patients who have this patient as their primary contact or who have the same mobile number as this patient entered in their patient records are also opted out. The primary contact can resume receiving text messages for the entire household by texting RESUME to 45827. Preferred Language - Select the patient's preferred language. English is the default. If the preference is a language other than English, the selected language appears on the Patient Information ribbon, which is available when you are viewing the patient's record. Currently, this information is for reference only. Preferred Location - Select the office that the patient prefers to receive treatment at. A matching patient will appear in the results list of a patient search box throughout Dentrix Ascend if that patient's preferred location is in a location to which your user account has access unless you use the advanced search functionality. Other than for patient searches, currently the preferred location is for reference only. Preferred Appointment Day/Time - Select the check boxes that correspond to the days of the week and/or times that the patient prefers to have his or her appointments. The days that are available correspond to the working days set up on your practice's schedule. The selected preferred appointment days and times appear when you are scheduling an appointment for the patient, so you can offer those times to the patient. Currently, this information is for reference only. In the Referred By search box, type all or part of the name of the referral source (patient, professional, marketing, or other) that referred this patient to your practice, and then click (or tap) the appropriate source's name in the list of matching results that appears. To remove an existing referral source from the patient's record, click (or tap) the Remove button next to the referral's name. To attach a note to the patient's record, click (or tap) Add Note. To edit a patient's note, click (or tap) a note's Edit button . To delete a patient's note, click (or tap) a note's Delete button . How do you delete a patient? Why is the "call me" phone number different than the patient's phone number? How do you integrate a existing patient into a new household? Why do I get and error on server message when adding patient phone number? How are you using the "Notes" section on the patient overview? Automatically link children under 18 to an adult. Allow choice of which adult for contact. Do not allow children under the age of 18 to be responsible party or head of household by default. Great idea. I posted this request on the "Feature Request" forum for you. Keep those good ideas coming, and thank you for helping us make Dentrix Ascend better.